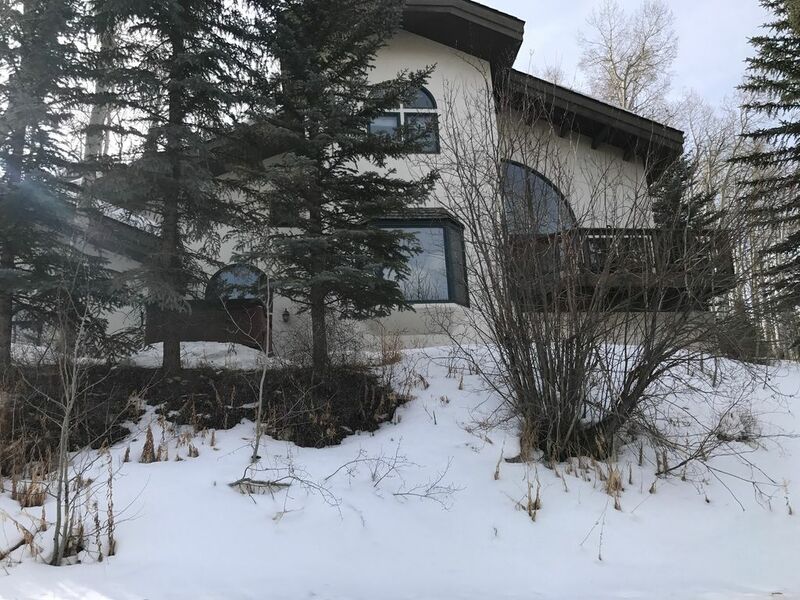 Spacious three-level duplex located high on a secluded residential street in West Vail, Highland Meadows - just 1 mile from the Cascade lift and 1.5 and 2 miles from Lionshead and Vail Village respectively. Beautiful setting against a spectacular wooded mountainside. Designer decorated; spacious open floor plan in living room, dining room and kitchen with dining seating that accommodates 14. This vacation getaway features five great bedrooms with four and one/half bath areas. The master suite includes a king size bed with a private balcony and a spacious private bath. There are two bunk rooms - each with 2 sets of bunk beds. The fourth bedroom features a queen size and a single size bed with private bath and the fifth bedroom contains a queen bed. The media room is cozy and features surround sound and a dvd library. The house is equipped with wireless internet and cable and a private hot tub installed in 2014. Enjoy the spectacular views out on the balcony while grilling a steak on the gas grill or sipping on a glass of wine in the warm relaxing hot tub. The house is on a quiet cul de saq and is nestled against the national forest. In fact, in the summer you can hike to the gondola on a trail right out the back door! This incredible vacation retreat is designed to be the perfect place to relax and enjoy a great time with family and friends any season of the year. Our family lived in Vail from 2004-2005 while my husband did a sports fellowship with the Steadman Hawkins clinic. At the end of the year, Vail was in all of our blood and we knew we couldn't say goodbye for good. We loved the home we lived in for the year - warm, spacious, removed from highway noise, on a quiet cul-de-sac backing up to national forest which was awesome for hikes in the summer and fall, and just 2 miles from Vail village. Fortunately, the owners agreed to sell the house to us! We now live in Texas but love getting back to Vail every chance we get - regardless of season! Vail is the most amazing ski mountain in all of north america. We chose this house in particular because it backs up to national forest (great for hiking and snow shoeing), is close to a great park, and is high enough up the mountain that the noise and sight of I70 are not factors. wonderful mountain views, hiking path right out back door, quiet cul-de-sac (no highway noise), roomy, two separate masters, media room, nice porch for outdoor dining and grilling, wood-burning fireplace, well-stocked kitchen, private hot tub, two miles from Vail village. spectacular views of the Gore range. We back up to national forest and you can hike up a trail to the top of the Gondola from behind our house. Media Room with surround sound and flat screen TV. Great location. Responsive owners and big enough for our large group. Our group enjoyed 5 glorious days in Vail and this home was terrific! We get together for a ski reunion every winter and we will definitely be returning to this lovely home. The house was great - plenty of room for all of us. We usually stay in and cook most evenings, and the kitchen was well equipped with everything from blender to cuisinart and plenty of pots and pans. There was also room in the garage to store our skis and boards and plenty of cubbies and hooks in the laundry room for helmets, gloves, jackets etc. We loved the wood-burning fireplace, the views, the hot tub and the distance from the highway (our last 2 vail rentals we did not return because of all the highway noise). The owners were also extremely helpful and accessible. We will definitely return to this home next year! Thank you! Very large house with excellent views! Enjoyed our stay but what made it so nice was how attentive and welcoming the owner, Maura was for our stay. You will need to drive and park in vail but as long as you factor this into the cost of the stay- it was nice not waiting for the shuttle in freezing cold weather!! Steep road leading up to house but this is how you get such great views. What a wonderful place! You have such an inviting home with so much charm and comfort...especially loved that there are windows everywhere that allows in such much natural light! Thanks also for having a fully stocked kitchen and an amazing laundry room -- that made everything so very convenient! What a great place to make memories -- and we did so this past week -- thank you! Wonderful early fall Vail vacation! We loved our stay at Highland Meadows! The house had everything we needed and was the perfect spot to enjoy the beautiful fall weather! The patio was great to enjoy a hot cup of coffee on the cool mornings and a nice glass of wine to watch the sunset! We really recommend visiting Vail this time of year! From the weather to Oktoberfest and the slower tourist season, it is the perfect time to enjoy all that Vail has to offer!! room and the other bunk room was shared by our 3 younger grandkids. The house was so comfortable and fit us perfect. Kitchen was well equipped & clean. The media room on lower level was perfect also for us. And We all loved the hot tub! The views were beautiful from every direction of the house. The wedding was in Vail Village which is a quick & easy drive. Vail Village is awesome & so much fun. We had at 3 rental cars & sometimes 4. We parked 2 in garage & 2 in driveway. We made it work! The rooms are spacious and nicely decorated. There are plenty of fans and we stayed cool. The laundry room is spacious for storage & also plenty of towels. We would stay there again for sure. Also we enjoyed our walks & loved the great scenery. It was a fantastic stay!!! The owners of the house were easy to communicate with & made things very easy. close to skiing, boarding, snow shoeing trails, snowmobiling and other fund winter activities. 1/2 mile from lovely city park (Donovan) with playground, basketball courts and playing fields. Just up the hill from Gore creek with gold water trout fishing. Great hiking all over Vail mountain, including a trail to the top of the Gondola right out our back door!